It can be difficult to eat healthy this time of year. Especially here in the Northeast where we just made it through one of the coldest February’s on record. Heavier fatty foods like mac and cheese or meatloaf and mashed potatoes are often enticing while really fresh produce is harder and harder to find. We have to remind ourselves to “eat your vegetables” like our mothers always said, because the idea of a salad for lunch when it’s 5 degrees outside, just doesn’t cut it. Enter the Middle Eastern Vegetable Bake. 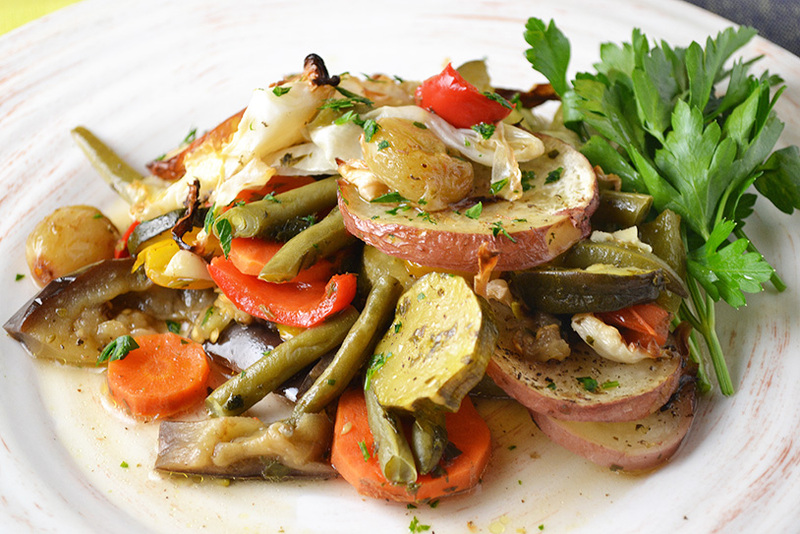 This vegetable mélange is the solution to healthy eating and cold weather cravings – with a touch of warmth. An old-fashioned recipe, straight from “The Art of Good Cooking,” by my grandmother Paula Peck – this is a healthy lunch or side dish that is sure to provide those daily servings of vegetables you’re missing. Easy-to-find vegetables like zucchini, eggplant, red pepper, cabbage, onion, potatoes, and carrots are thrown together into a casserole then baked until softened and the flavors are combined. The fragrant aroma of garlic and fresh parsley fills the kitchen as it bakes. 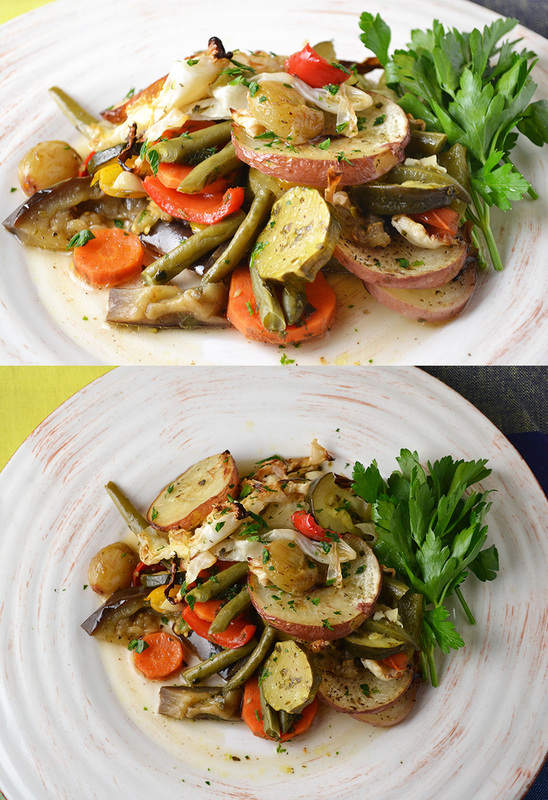 Any excuse to use the oven to help heat the house up this time of year is a bonus but the resulting guiltless veggie dish makes it even better. I’m not sure what makes this dish Middle Eastern – if I had to guess, it would be the addition of grapes. It sounds a bit strange but baked grapes add a sweetness that the other vegetables are missing and balances the dish. The different textures and juices of the vegetables in this simple casserole, will make remembering to eat your vegetables this winter, a much easier task. Pour a few tablespoons of the olive oil in a large casserole or baking dish. Make one individual layer of each of the vegetables (including a layer of garlic) and grapes, seasoning each layer with salt, pepper, parsly, oregano, basil, bay leaf, and a little olive oil. Make the top layer an assortment of all of the vegetables. Bake uncovered for 30-50 minutes or until all vegetables are tender. Serve warm with hot sauce (if using).